Most after sales questions can be solved by reading the instructions again, we cannot stress enough how comprehensive they are. How much does a floatron cost? £285 inclusive of VAT and comes complete with electrode, ion test kit, cleaning brush and plastic screen. The floatron should pay for itself within two years in an average size pool. It converts water into mineral water by using solar power and a long lasting sacrificial electrode containing copper, silver and other trace minerals. 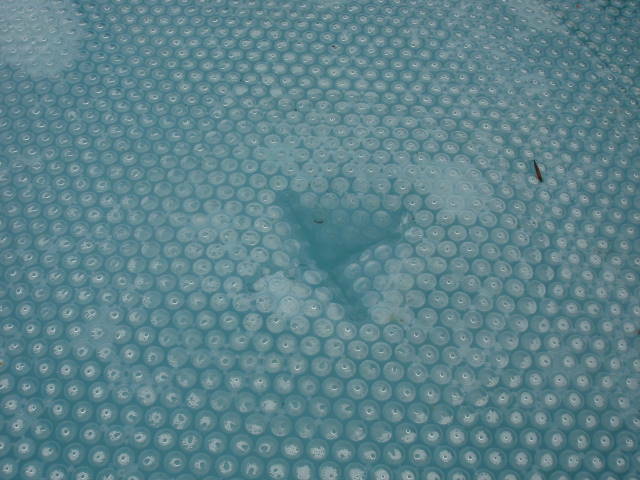 I have a pool cover, so surely floatron won’t work with a cover? 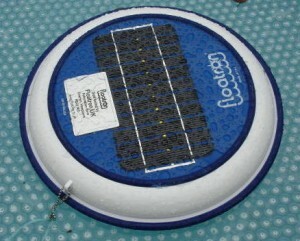 Nearly all UK customers who purchased floatron® have covers on their pools and all feedback has been very positive with floatron® working well with most varieties of cover that float directly on the water. 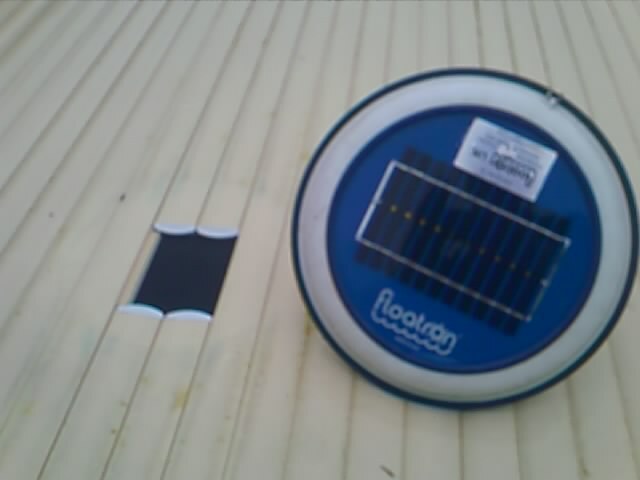 The choices are to open the cover enough to float the unit, or cut a 3 inch (~7cm) “X” into the cover which allows the electrodes to remain in the water while the top is exposed to the sun. If you are unsure on fitting, especially with a slatted cover, we will be happy to advise you. Please contact us if you have a safety cover. How much does it cost to fit? Nothing. Just tether it near to an inlet or outlet, so water can pass through. Just the size of a frisbee. It’s in a box 12 x 12 x 8″ and weighs around 5 lbs (2.5kg). How many floatrons do I need? Pools of up to 20,000 imperial gallons (91 cubic metres) need only one floatron. Larger pools need two or more. 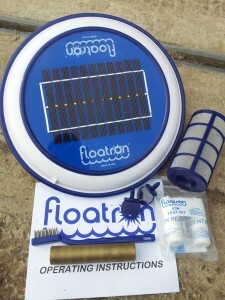 Smaller pools may not need the floatron floating full time, please refer to the instructions. Does it work in indoor hot tubs and spas? Yes! Think of the convenience in not having to shower afterwards! Download Hot Tub Instructions. Does floatron work in indoor pools? Yes, if there is plenty of daylight. But any floatron purchased from floatron UK can be returned for a full refund. *conditions apply. We recommend carrying out an operational test as per the instructions to see if there is enough light. In pools without enough light, we recommend using a puronizer which is an in-line (plumbed in) ioniser please information sheet and then contact us for a quote. Will it work in a salt pool? Brilliantly. Simply reduce the operating time of the salt chlorinator. Will it work with a Bag type filter i.e. Des Joyeux? Yes – we have lots of customers, especially in France who have bag filters rather than sand filters. Does floatron work in fishponds? Yes, providing there’s circulation and the water is captive please see section about ponds. So long as you follow the instructions and specific pond instructions, we can assure you that your fish will remain healthy, and you’ll be able to see them better! My pool dealer says floatron is rubbish! Few pool dealers have understand floatron, as we do not sell to the trade, they will have had very limited if any experience of floatron pools. Pool dealers are likely to be reluctant to recommend a product which will reduce their chemical sales. I don’t spend much on chemicals, so why should I buy one? Some people have neutral water of 7.4 pH. In these circumstances, chlorine is effective and not so necessary, but you are in a minority. I bet you dose hugely at close down, start up and on return from holiday. Remember no algaecide, no shock treatments. Yes, provided you have captive & circulating water and quality sand in the filter (not all filters have sand i.e. Des Joyeux) and pH between 7.2 and 7.8. If the floatron is not working as expected after 3 – 4 weeks, please read the instructions again, carry out an operational test and then contact us with ion readings from the pool water and backwash water, and with the size of you pool. We are experienced in floatron usage and can offer the best advice. Are there any circumstances under which it won’t work? Yes, if the pool leaks or the sand in you pool filter needs replacing, (some filters i.e. cartridge filters or diatomateus earth filters do not contain sand, therefore this will not be an issue) or if the pH is outside the 7.2 – 7.8 range. Floatron is not compatible with Bayrol/ Baquacil or Softswim Brand Download instructions how to convert away from these products. The total dissolved solids (TDS) is the sum of the weight of the soluble compounds in the pool water. If all the water in a swimming pool was allowed to evaporate, TDS would be what was left on the bottom of the pool – like the white deposits left in a boiling pot after all the water has evaporated. Some of this dissolved material includes hardness, alkalinity, cyanuric acid, chlorides, bromides, and algaecides. TDS also includes bather wastes, such as perspiration, urine, and others. Normal drinking water contains a few hundred parts per million TDS. Brackish water contains 3,000 – 5,000 ppm. Sea water typically contains 35,000 TDS. Chemicals added to pool water to maintain sanitation, pH, alkalinity calcium hardness and to combat algae etc. all add total dissolved solids to the pool water. Dirt, dust and other debris introduced into the pool by bathers also contribute to dissolved solids. High levels of TDS and the accompanying turbidity will impair the performance of the disinfectant, algicide, and other treatment chemicals added to pool water. As TDS levels rise, more “active disinfectant” is required to eliminate organisms in the pool water. Because organisms embedded in the solid particles, causing cloudy water, are protected from the disinfectant this is not generally a problem to TDS levels of 1500 ppm, at normal pool disinfectant levels. In addition high levels of TDS can enhance galvanic corrosion of metals, reducing the life of heaters, pipes and pumps. 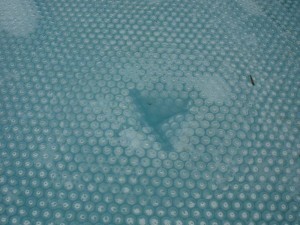 Occasionally pool water may become cloudy due to a build up of undissolved solids and ammonia, this is normally treated with a flocculent, however some of these can have a detrimental effect on pool filter sand causing the filter to remove the minerals produced by floatron, this is easily detected by mineral testing the backwash water. We recommend Jolly Gel, which has proved to work excellently along side floatron. Products containing Aluminium Sulphate must not be used. Why do I need some chemical and what type of Chlorine do you recommend for use alongside floatron? Some contaminants in your pool such as dust, suntan lotion, body fluids which unfortunately but inevitably get into all pools, are not affected by minerals. There is an extremely tiny risk of the legionella bacteria , if no chemicals are used at all, therefore we recommend that you do use a minimal amount of chemicals as per the instructions. This is purely as a precaution, we still believe that ionisation is the safest way to cut down on chemical usage in your pool. How long before floatron takes over the purification process? The average pool size is 15,000 gallons (68 cubic metres). On average, three weeks. Then you start enjoying bathing in clear, safe and clean water. Can you summarise the benefits and tell me why should I buy floatron? It’s the only solar powered water purifier on the market that doesn’t require costly, complicated fitting and that works well with a pool cover. It’s a quality product with a extensive warranty. It’s healthy for your swimmers, your fish and for the environment. It will eliminate the problems associated with too much chlorine. It works. Please contact us if you have any further questions. It is important to us that all out customers are happy with the floatron – happy customers are our best from of marketing!